I had a bit of denim left over from my Jeans and thought I’d make a quick cushion. It was the perfect quick project to try out the gold metallic thread I’d just bought. I measured the cushion pad & added seam allowance for the front. For the back; I measured the length and half the width. Then I added seam allowance to one side and a 9cm extention to the centre for a button closure (with a 3cm overlap). 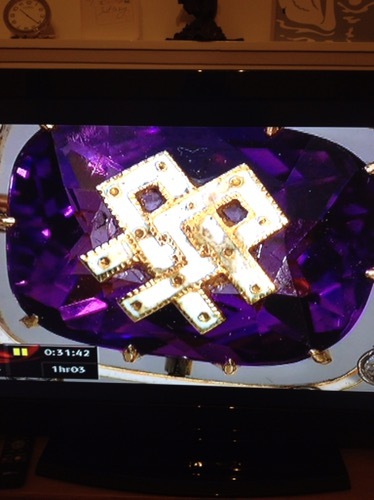 When we got married MrA saw a piece of jewellery with a design of two linked A’s on it. We decided to use it as the ‘logo’ for our invites etc. No, we didn’t buy it! But I thought I’d try and recreate it on the cushion in metallic thread. So rather than (potentially) ruining the pieces I had already cut, I had just enough fabric left to make a pocket and a few scraps to try out on. I didn’t get on well with the metallic thread. What I thought was going to be a quick fun project turned out taking much longer. 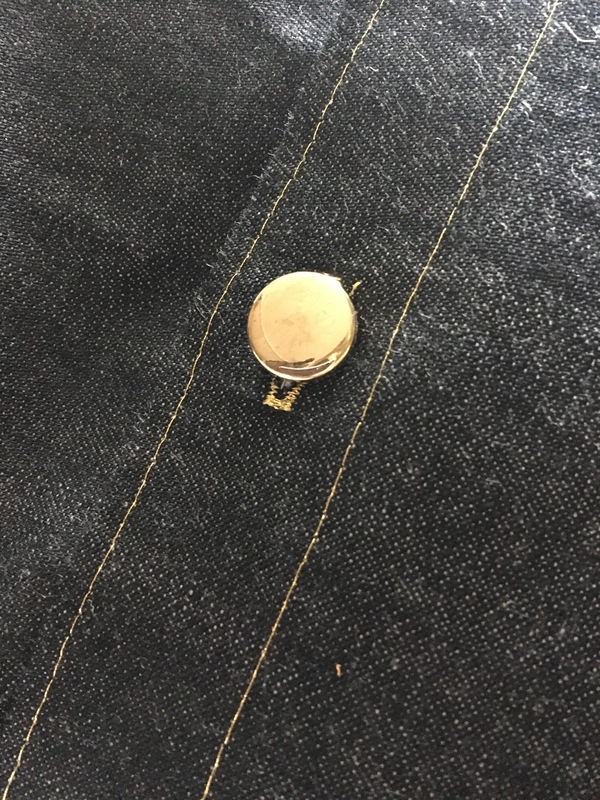 After playing around with double thread, single thread, tension settings etc; I finally settled on single metallic thread on top, regular thread in the bobbin, a size 70 needle and the tension down a notch (to 3 on my machine). While I was doing that I also experimented with the stitches. It took a while, but in the end I opted for a very short 3 step zigzag stitch. This one seemed to fill the most space. With all the broken threads, button pressing, switch dialling, bunching up under the foot plate as well as trying to concentrate on the pattern, this bit probably took for ever! Any way, eventually I got it done. It wasn’t plain sailing. The metallic thread didn’t seem to like being in the machine at all, at least not under my supervision. I got so engrossed in it though, I didn’t notice the time. I’m not sure how long it took in all, but I didn’t get to the supermarket and we had beans on toast that night. I never knew I needed a cushion with a pocket. Although we do sit on the remote controls from time to time, we never lose them! I’m not encouraged to use metallic thread again… Any tips? More research on metallic thread needed. 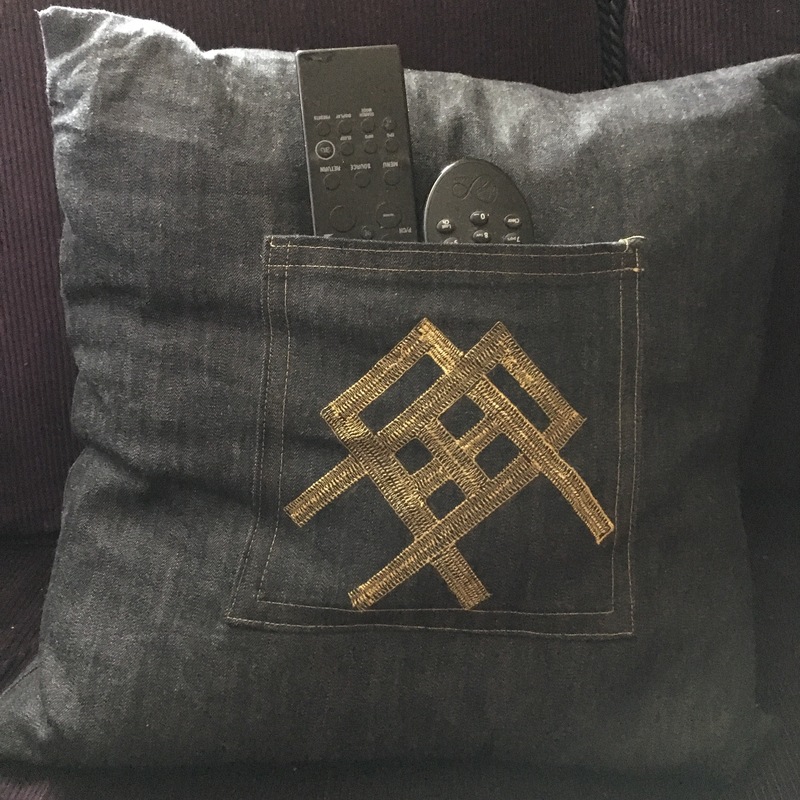 Cushions are the perfect small project to try new tools/ techniques. There is a special gadget you can stick to your machine and run the thread through, which will lubricate the thread and supposedly ensure smooth stitching. I’ve been wondering whether I need this, but I found switching to an embroidery needle did wonders. It has a much larger eye than a standard needle.